Sometimes you need to search long and hard for a great record, and sometimes you just need to click on a Shaky Leaf. Ancestry.com uses ‘shaky leaves’ to indicate that someone in your tree has a hint, or possible match to a record in their vast collection of databases. I had basically exhausted all of the hints in my direct ancestors so I was very excited to see a new shaky leaf appear on Bridget Foy Groucutt. Bridget Foy Groucutt is my 2nd great grandmother and this shaky leaf hint indicated that a death certificate match may have been automatically made. Of course I review all of these hints meticulously. There are often useless record hints for a person you know isn’t your ancestor. On more than one occasion, Ancestry.com has suggested a possible match of a record for someone who lived or died 100 years from when the record was created. This death certificate was a legitimate hint however. It told me quite a bit about Bridget and her life. At the end of her life, Bridget was at living at 1026 Huey Street in New Castle, Lawrence, PA with her husband George and daughter Sara, who was the informant on her death. She died of carcinoma of the large bowel after being sick for 6 months. An infection one month before her death and surgery just two weeks prior no doubt made for a difficult last stage of life for both her and her family. Her death certificate tells us that she was born on 2 February 1862 in England, the daughter of John Foy and Sarah Coyne, likewise born in England. She was a house wife who tended to her home and large family. At the time of her death on 14 October 1925, she was 62 years old. She is buried in Saint Mary’s Cemetery in New Castle. 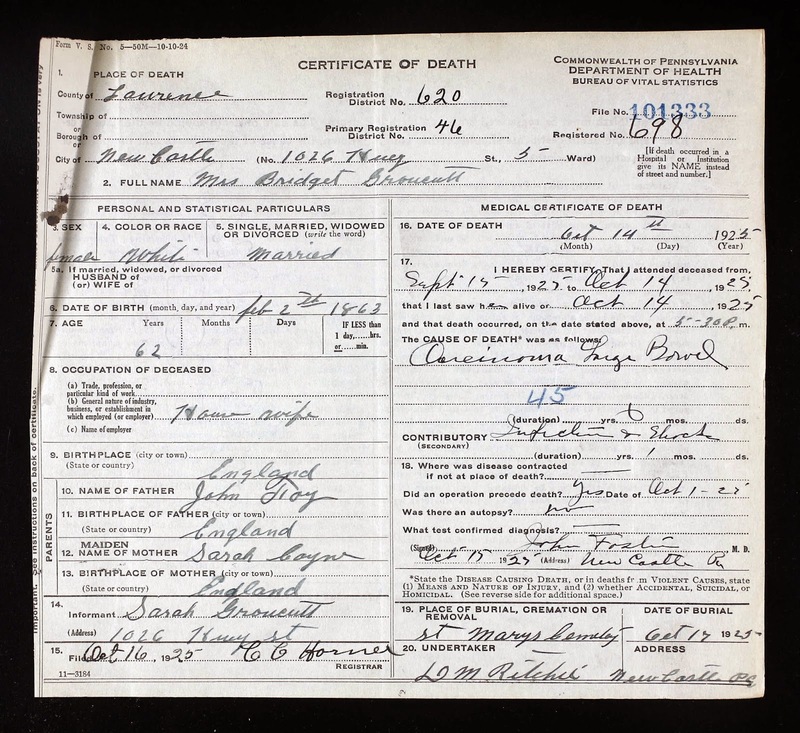 Pennsylvania Historical and Museum Commission, “Pennsylvania, Death Certificates, 1906-1944,” database, Ancestory.com (http://goo.gl/jTgDq4%5D: accessed 8 Oct 2014), entry for Bridget Groucutt, File 101333 (16 Oct 1925).